We are thankful for the countless hours these individuals put in to help us provide music to the community. We would not be able to do so without their time, energy, and assistance. Mrs. Linda W. Taylor has been a member of the Pomona Concert Band since 1968. During that tenure she has held the Solo Clarinet chair, was Assistant Conductor for several seasons, and since 1983 has played in the Tuba section. In March 2006, she was appointed Conductor and Musical Director of the band. In addition to playing in the PCB she is a founding member and co-manager of the Golden State British Brass Band, plays in the Mentor's Tuba Quartet, and is a founding member of the Promenade Brass. She has also played with the Claremont Winds, the San Gabriel Valley Symphony, the La Mirada Symphony, the Colorado Brass Band, and with several brass bands in England. Dr. Jorge Garcia, Pomona Concert Band Assistant Director, has been involved in music education since 1969. He has taught music on all levels from college to kindergarten. He has conducted several honor groups including the Memorial Orchestra for President Chiang Kai-shek, the Sino-American Honor Band, and the Taiwan Youth Symphony Orchestra. 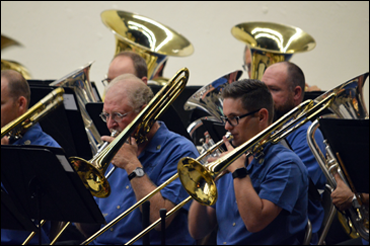 He is a published composer and has written several pieces for the Pomona Concert Band and the Golden State British Brass Band. He is a well-known lecturer in the areas of Classroom Motivation, and Lifelong Learning. He received his doctorate in Music Education with an emphasis on Lifelong learning in 2008. He has given presentations in several countries and was a speaker at the International Conference of Lifelong Learning in Budapest, Hungary, and the International Handbells Conference in Brisbane, Australia. In the fall of 2011 he was a guest lecturer at the University of Mindanao, Republic of the Philippines, lecturing on the children's books of C.S. Lewis. He directed the Faith Academy Orchestra Camp in Davao City, Republic of the Philippines, for two years. He joined the Pomona Concert Band in 2005 playing tuba but has also played Percussion and Bass Clarinet. He also participates in the Golden State British Brass Band and founded the Trilogy Music Makers Brass Ensemble, Temescal Valley, CA. His music is available at Talent Music Publishers. Send Email. Mr. Kerry Kline joined the Pomona Concert Band in 2008 and has been in music education since 2004 when he received his Bachelors of Music, in Music Education, from the University of Tampa. While there, he studied trombone with Donald Zegal, a trombonist of the Florida Orchestra and conducting techniques from Dr. Jeffrey Traster. He was a founding member of Pi Mu, a National Music Fraternity of Phi Mu Alpha Sinfonia, and was a sponsor of Tri-M, a high school national music honors society. Prior to leaving Florida, Mr. Kline was the Director of Instrumental Music at East Bay High School where he conducted numerous ensembles including the Wind Ensemble, Marching Band, Jazz Ensemble, and the Chamber and Symphonic Orchestras. Under his leadership, his students were recognized musically in local, state, and national festivals with high honors and awards. Mr. Kline was also the chairman of the Hillsborough County Orchestra All-County Music Festival and hosted annually, the Hillsborough County Middle School Music Performance Assessment Festival for Band. In addition to performing trombone with the Pomona Concert Band, Mr. Kline regularly joins with the Pomona College Band and the Gay Freedom Band of Los Angeles - an ensemble that promotes acceptance and celebrates diversity by bringing together musicians from across Southern California for performance and educational opportunities that embrace equality, inclusion, and the love of music. He has been a Board of Director of the Pomona Concert Band since 2014 and in 2018, was appointed an Assistant Director for PCB, bringing with him several years of classroom experience in band and orchestra conducting.